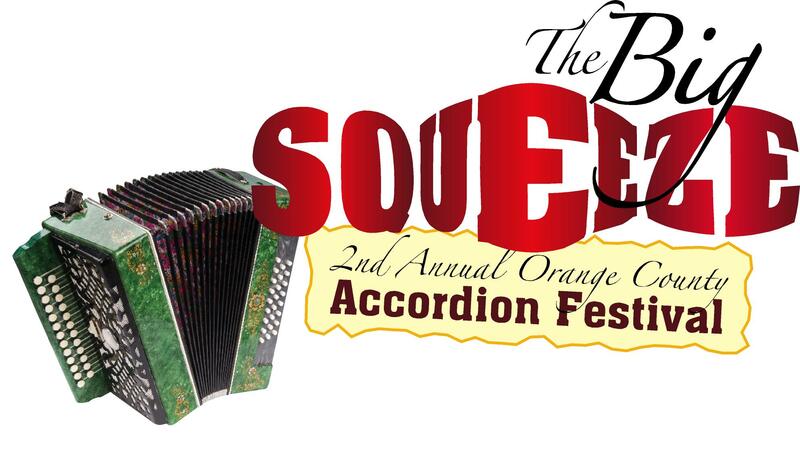 "The Big Squeeze", 2nd Annual Orange County Accordion Festival returns 10-10-10 in Costa Mesa, CA to showcase the accordion's cross cultural appeal and adaptability in a variety of music genres. It's not just a Lawrence Welk music box! “Over the years, the accordion hasn’t gotten much respect, which is too bad because when all is said and done,the accordion is fun." Jim Gilman, The Squeezinator. The word accordion comes from the German word “akkord” which means “agreement, unity, and harmony.” The Big Squeeze is all about the coming together of many styles of squeeze box music in one setting. 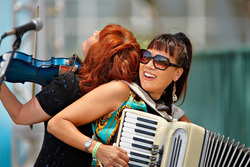 “The Big Squeeze"- which made its debut last year as the first ever Orange County Accordion Festival returns to the Orange County Market Place in Costa Mesa on Sunday, October 10, 2010. The event will run from 10 a.m. to 4 p.m. and in conjunction with all of the swap meet activities at the O.C. Fair & Event Center. 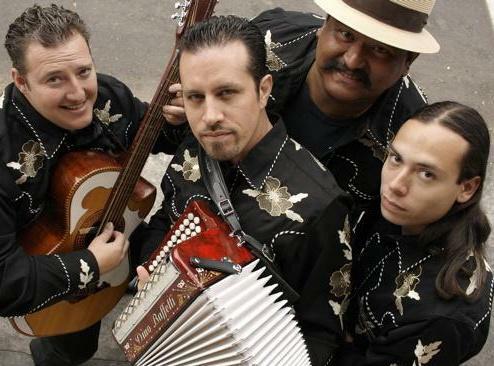 It will feature five stages of accordion based music showcasing diverse genres presented by more than 40 squeeze box experts and musicians aiming to help reverse the accordion’s narrow image as a polka music instrument. The accordion’s popularity in the U.S. is easily be associated with television’s Lawrence Welk Show, which aired from 1955 to 1982 and often featured well known accordionist Myron Floren as well as Welk, who learned to play as a child. However the Welk show and the accordion had a hard time keeping the appeal of the younger audiences. The revolution in popular musical tastes eventually curtailed the accordion’s popularity. “Over the years, the accordion hasn’t gotten much respect, which is too bad because when all is said and done – the accordion is fun. It’s the only musical instrument that will play bass notes, chords, rhythm, and melody all at the same time and still be portable and relatively easy to learn, “said accordionist Jim Gilman of Yorba Linda, aka the Squeezinator, who is returning as a performer and stage host. Cory Pesaturo, a 24 year old World Champion accordionist from Rhode Island played the accordion on the Welk show at age 12 to fill in for an ailing Myron Floren. However, Pesaturo claims it is the Welk image that gives the accordion a “bad rap” and has focused his music career around killing the Lawrence Welk stigma of the accordion. Pesaturo began playing the accordion at age nine. In 2002, he became the youngest person to win the National Accordion Championship. Last year he won the Coupe Mondiale World Digital Accordion Championship in Auckland, New Zealand, and became the first American to win a World Accordion Championship since Peter Soave 25 years ago. He has won many other championships, has performed throughout the world and entertained at the White House several times including private functions for President Bill Clinton. A graduate of the New England Conservatory of Music in Boston, MA he was the first musician there to major and graduate in accordion. 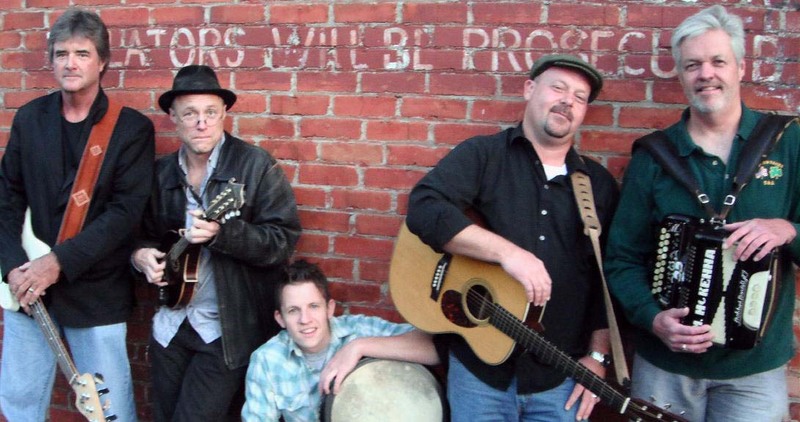 The Main Stage bands will sound off with three different genres: Irish, Tex-Mex and Cajun-Zydeco. They include Slugger O’Toole, a Southern California based traditional Irish-Celtic rock quintet featuring Johnny McKenna on button accordion, Conjunto Los Pochos, a quartet of musicians from the Los Angeles area, with Otono Lujan on diatonic button accordion, performing traditional and original Texas and Mexico conjunto music styles and Grammy nominated Cajun-Zydeco music band, Lisa Haley and the Zydekats, also Los Angeles based, with Gee Rabe aka L.A.‘s Accordion Diva on piano accordion. Elsewhere Puerto Rican native, Roberto Rosa, now from Elk Grove, will play a variety of Latin jazz, merengue, salsa and folkloric music. Squeezinator Gilman, who makes a living as an accordionist, will perform a variety of styles and serve as host for a stage which will feature Acid Jazz Standards of the Costa Mesa based Mile 24 band headed up by Jeffrey Iacono, who runs a Borsini Accordion Shop in his garage in Costa Mesa, doing repairs, professional tuning and sales of the high end Italian made accordion. Also, Dempsey Pappion of Buena Park and his cousin Joe Fontenot of Rosemead, both Louisiana natives and button accordionists will play Old Style Creole music while Phil Parlapiano of Studio City aka “Mr. Squeeze” will perform classic blues, zydeco and original music. Parlapiano has toured playing the accordion with top names such as John Prine , Rod Stewart , Tracey Chapman, Lucinda Williams and Dave Koz, who range in music styles from rock, pop and blues, to rockabilly, jazz and folk which in itself show the accordions’ wide range adaptability. Among the solo performers is Bryan J. Olgin of Gorman playing rock and roll oldies on a small piano accordion called a muzette and Linda Herman of Seal Beach, who makes a living playing music for ballroom dancing throughout Southern California on her digital Roland FR7X accordion. While many accordionists will stray from the polka persona, it is not intended to disregard it altogether. It still holds a strong place at Oktoberfests and many enjoy keeping that flavor alive and well. Doing so will be the seven member group called Polka Squeeze presenting “Return of the Chicken Dance,” and is under the direction of Lucille Camatti of Rancho Santa Margarita. While the ensemble plays a wide range of music—from classical pieces to pop standards, they will stick to German polkas, and of course, the famous Chicken Dance song. Bobby Dietsch, from Crestline and an accordionist with Polka Squeeze, will do a solo presentation of Bavarian music. Children will have a way to get acquainted with the squeeze box during toy accordion jam sessions led by Ukulady (Thessaly Lerner) and her toy accordion Squeezaly. She will also lead a kid’s Mardi Gras parade with stilt walkers and other entertainers topped off by an Accordion Piñata Smash! Various accordion and music companies will demo their latest models including Borsini and Roland US . Open jam sessions, lessons and workshops will be included. "You can’t know the number of people who have come up to me over the years and said ‘my father, my aunt, my sister, brother, etc., used to play the accordion.’ I don’t think many other instruments can make that claim. It seems to bring people back to a happier time, “Gilman said. All entertainment and activities are included in admission, which is $2 or FREE with a canned food item donation for the Second Harvest Food Bank of Orange County. Children 12 and under are always free. Free parking or preferred parking for $5. All stages include dance floors and plenty of seating. For a more information and a complete schedule of the Big Squeeze visit http://www.ocmarketplace.com or call 949-723-6660. Jill Lloyd & Associates, Inc.
Conjunto Los Pochos, Tex Mex band featuring Otono Lujan on button accordion. Ukulady and Squeezaly will host a kid's toy accordion jam. Slugger O'Toole brings their Irish/Celtic sound with Johnny McKenna on accordion.